OCCT 3.10 is out now. 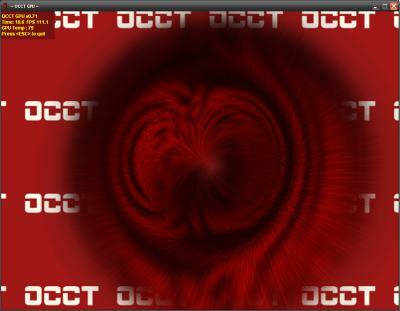 OCCT (OverClock Checking Tool) is an stability test utility for overclockers. 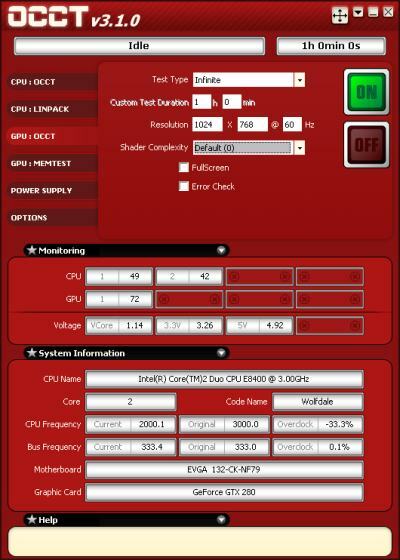 It allows to test the CPU, the system memory and the GPU. You can download it HERE. I tested the GPU stress part and I must say it does a good job. Here is a small comparative between OCCT GPU and FurMark (the graphics card was an EVGA’s GeForce GTX 280 with default clocks). Keep in mind that OCCT GPU uses Direct3D acceleration while FurMark uses OpenGL acceleration. In both cases (OCCT GPU and FurMark) the current required exceeded 80A (amperes) so power consumption was around 100W for the GTX 280! You may also want to simply use MSI Kombustor for GPU stress testing. While both OCCT and Furmark are good for stability testing, my take would be Kombustor as it stresses the GPU even more.